I wouldn’t want to be in Fargo, North Dakota this time of year. 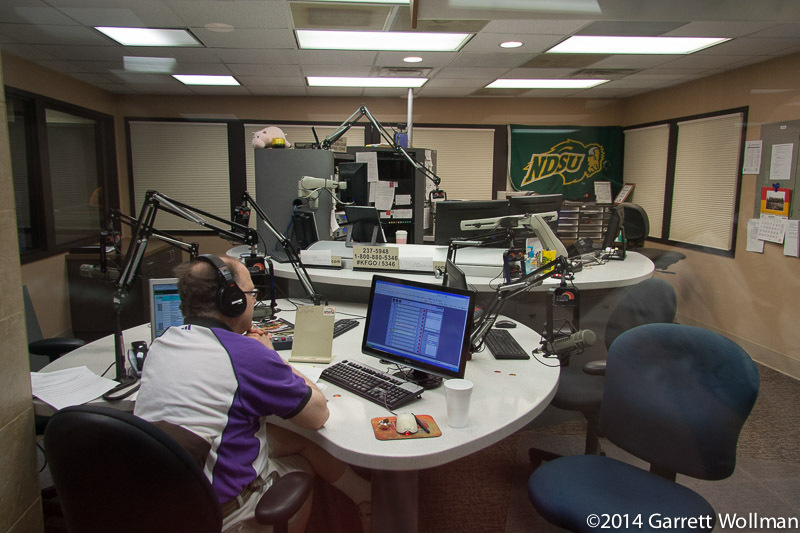 But in August of 2013, the sun was out, the weather was dry and warm, and the people of Fargo and vicinity were as friendly as could be when it came to opening the doors of their broadcast facilities and showing us around. 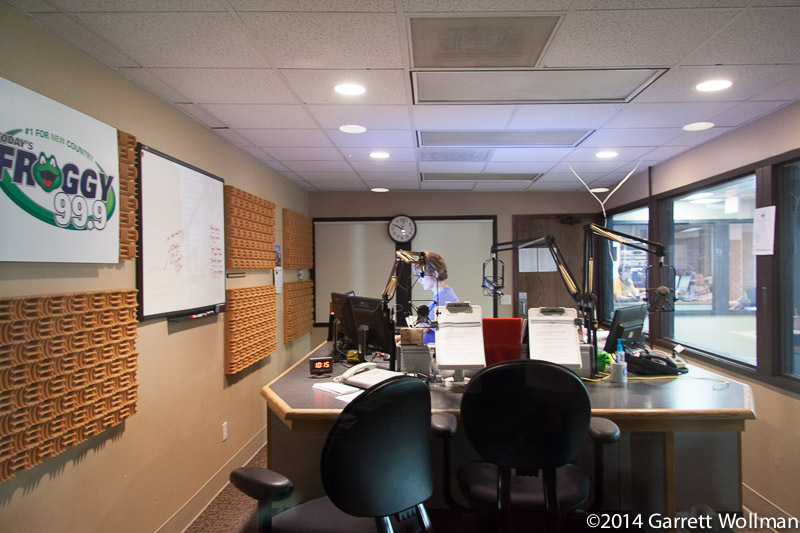 In last week’s installment, we visited the current studios of WDAY radio and TV, the broadcast arm of the Forum, the local daily paper. But before WDAY occupied that big space in a former insurance company building south of downtown in 1980, it was in a smaller building in the heart of downtown at 207 North 5th Street starting in 1956 – and just as WDAY-TV handed over its original tower south of town to public broadcaster KFME (Channel 13) when it moved to a taller stick in the 1960s, it sold its old studio building to KFME in the early 1980s. 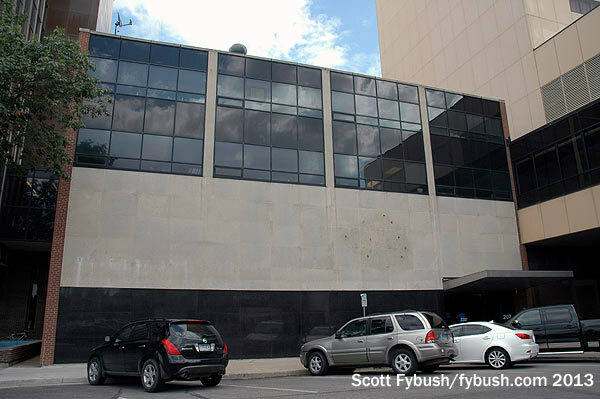 Old-timers in town still know this as the “American Life Building,” which is what it was called when WDAY moved in. 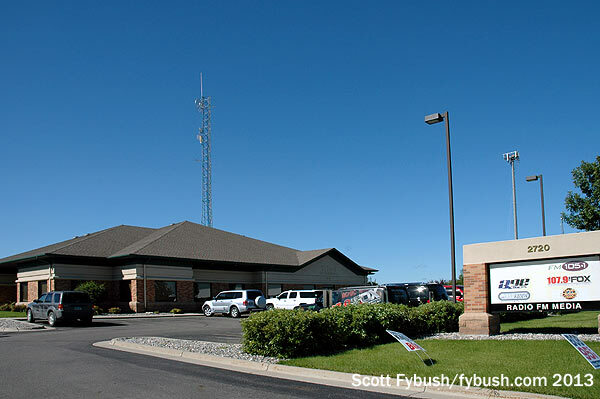 Today, it’s the headquarters of “Prairie Public,” the umbrella name under which nearly all the public TV and radio stations in North Dakota operate. 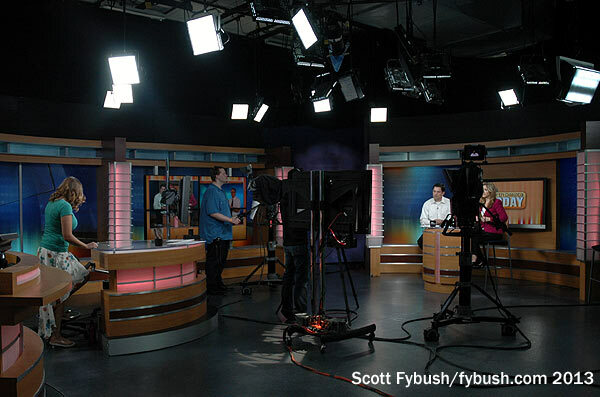 Today’s Prairie Public is an amalgamation of three public broadcasting entities from around the state: Prairie Public TV started in 1964 as just KFME here in Fargo, then gradually added a statewide network of full-power TV signals and translators, followed by the launch of Prairie Public Radio out in the western part of the state in the 1980s. Up north of here in Grand Forks, the University of North Dakota had a broadcasting history stretching back to 1923 and the launch of AM station KFJM, and here in Fargo, what’s now North Dakota State University launched a carrier-current station in the 1950s that eventually became FM station KDSU (91.9), which morphed from student-run to public radio in the 1980s. 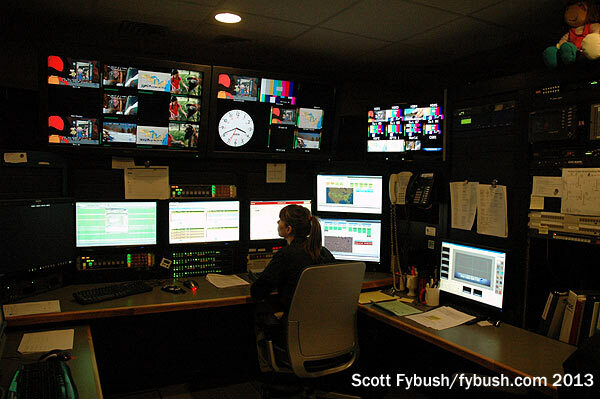 The network’s master control is here in Fargo, down on the ground floor of the building; from here, a microwave network stretches across North Dakota and up into neighboring Manitoba, where Prairie Public is the “local” PBS outlet, drawing a lot of its membership revenue from the big city of Winnipeg, which has more residents within city limits than live in the entire state of North Dakota. 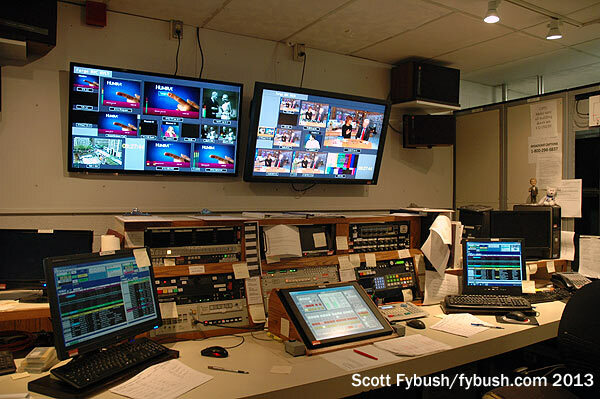 Prairie Public’s TV studio is on the first floor, in the same space that was WDAY-TV’s main studio; there’s a control room adjoining it, as well as space for volunteers and a big scenery shop in back. 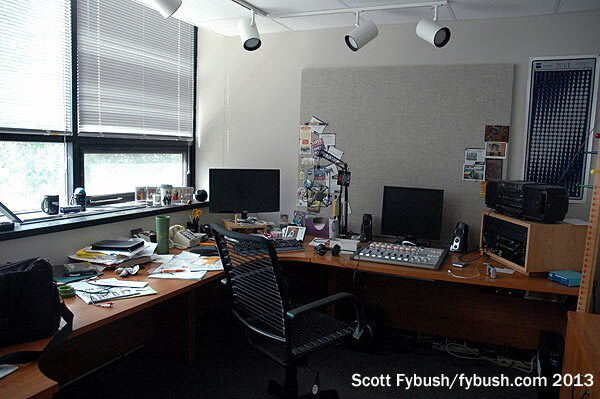 Business and engineering offices are upstairs on the top floor, and just below them, where the city’s extensive skyway system cuts through the building, we find the Fargo studios for the Prairie Public radio operation. Prairie Public runs two networks: its flagship News and Classical service is the outgrowth of the original 1980s-era Prairie Public Radio, and it’s still based over in Bismarck, the state capital, while its Roots, Rock and Jazz service, with a heavy AAA flavor, is the outgrowth of venerable KFJM at the University of North Dakota and still originates from that campus up in Grand Forks. 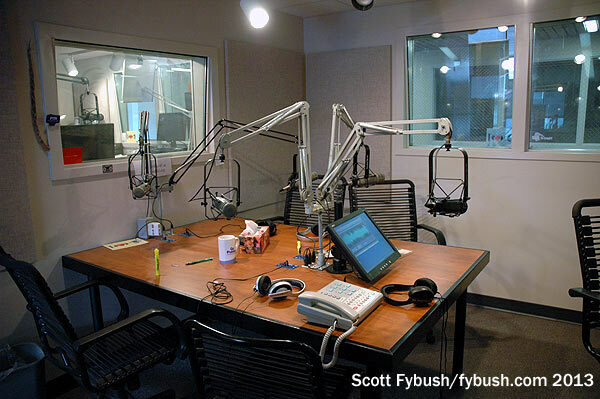 That, in turn, makes Prairie Public somewhat unusual as statewide public radio services go: in Fargo, by far the state’s biggest market, it has just a single radio outlet, KDSU (91.9), and over the course of the day the KDSU schedule shifts back and forth between the two networks to provide a hybrid service to the market. 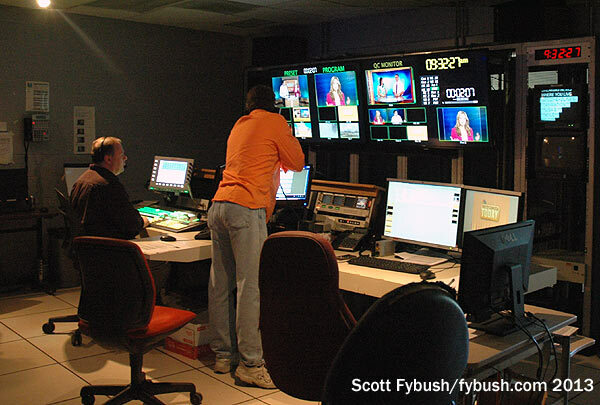 Because neither network originates here, the Fargo studios – a newsroom area along the front of the building and a small control room/talk studio behind it – serve as a bureau for programs on both networks. 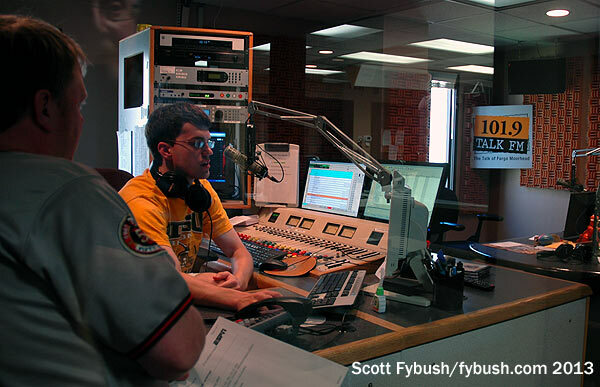 A block to the west on Broadway, the city’s main north-south drag, we find the other radio studios in downtown Fargo. 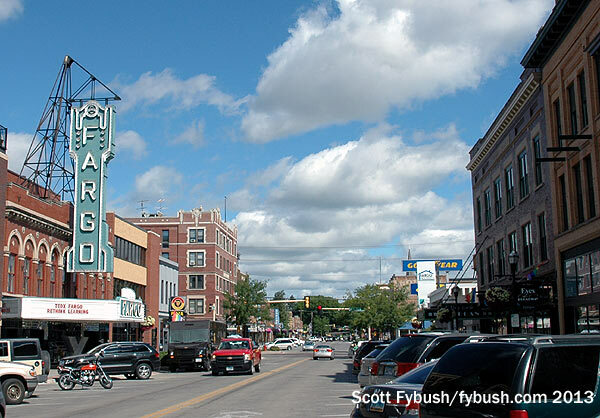 The “Radio Center” at 64 Broadway is a prominent streetside landmark on a strip that’s full of offices, restaurants and entertainment (yes, downtown Fargo is a thing! ), and they’re friendly to impromptu visitors, too. 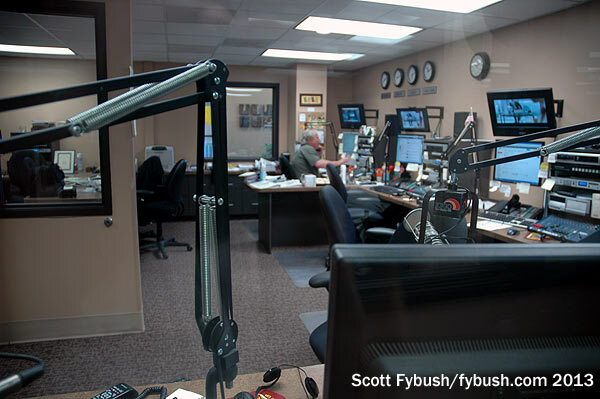 The station lineup in here has changed a bit over the last few years; at one time, this was where local talk veteran Scott Hennen ran his “Flag” talk station (WZFG 1100, licensed across the river in Dilworth, Minnesota), but today it’s home to two FMs owned by Great Plains Integrated Marketing, classic country KQLX-FM (106.1 Lisbon) and classic rock KEGK (106.9 Wahpeton), which occupies the prominent corner window studio. 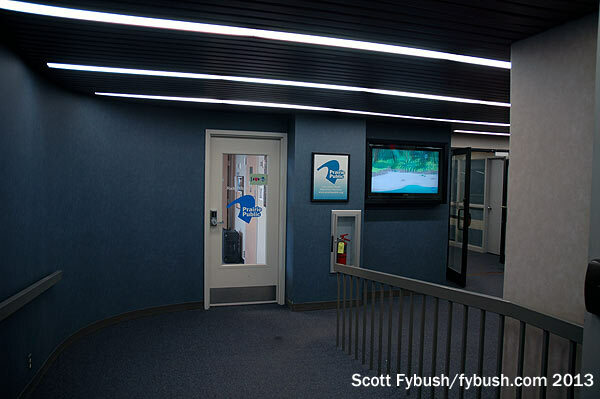 The station offices are mostly upstairs, with a nice balcony view of low-rise downtown Fargo. 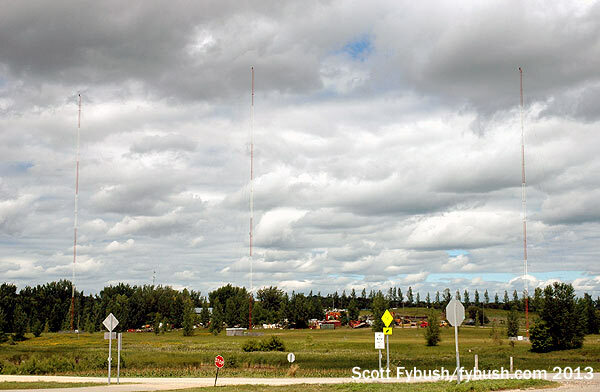 One more before we head out of downtown Fargo: just west of the bridge that brings US 10 into downtown Fargo from Moorhead, Minnesota across the Red River of the North, a cell tower also holds the single bay of KXBQ-LP (95.9 Moorhead), one of two LPFMs in town. This one plays alternative rock and goes by “Dive 95.9,” a big change from the religious format it started with a few years ago. 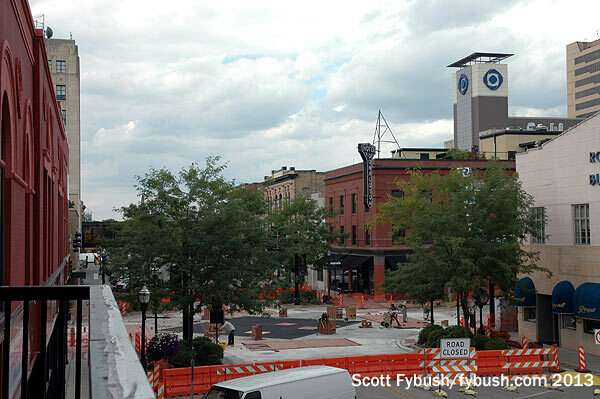 The next stops on this virtual tour of Fargo are south and west of downtown in the semi-suburban sprawl that extends down University Avenue, the old US 81 corridor that heads southbound from downtown toward I-94. 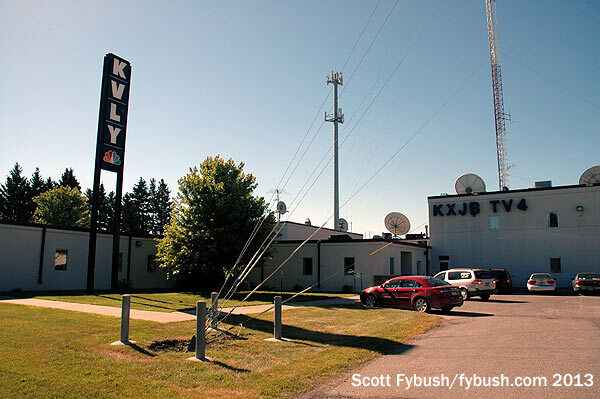 We saw the towers of KVLY (Channel 11) and KXJB (Channel 4) in last week’s installment, and the next morning we got to go back and see their studios on 21st Ave. South, the southern frontage road along 94. 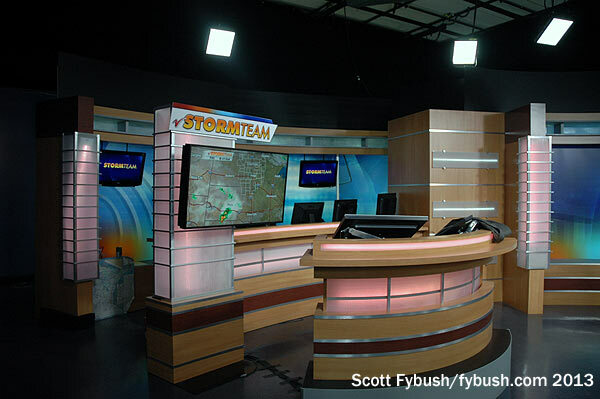 As with so many smaller-market TV stations of this vintage, the KVLY studios are something of a warren inside of corridors and additions. 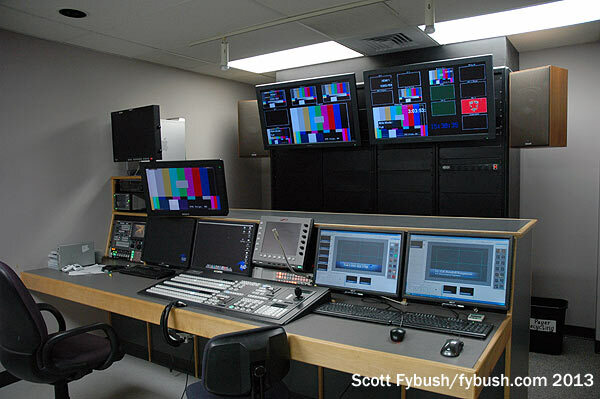 The technical plant at the heart of the building includes master control for KVLY’s NBC signal, KXJB’s then-CBS, and the MeTV programming that moved from 11.2 to 11.3, as well as a recently-updated production control room for newscasts and a big rack area that’s slowly transitioning from the old analog era to the digital world. 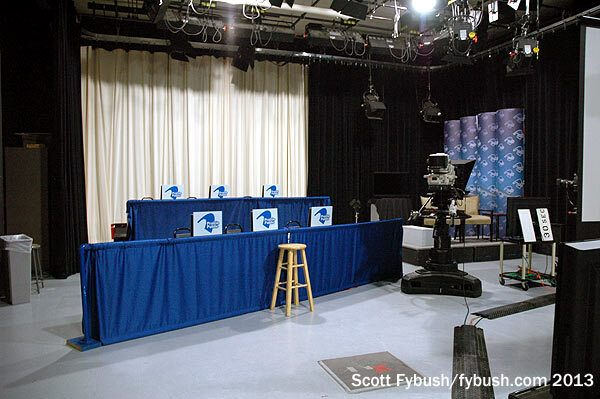 A camera malfunction means we don’t have a good shot of the newsroom to show you, but it sits along one back corner of the building leading into the studio, where the set was being tested that morning for a new morning news show that debuted right after our visit in 2013. How did the FCC allow what was effectively a TV duopoly to slip past it as late as 1959? And who could have imagined that channels 4 and 11 would once again join forces many decades later? 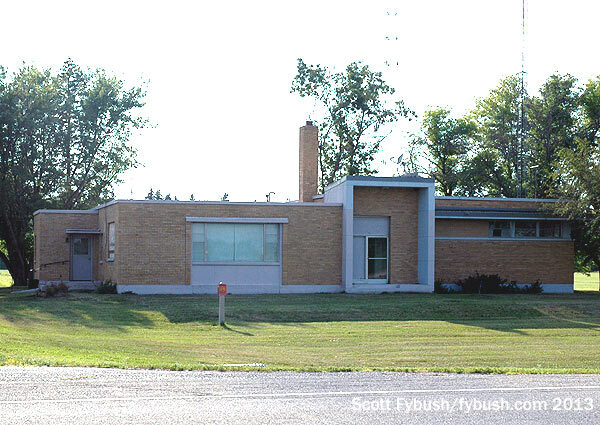 It’s fitting that our next stop, at 1020 S. 25th Street, follows along on that history. 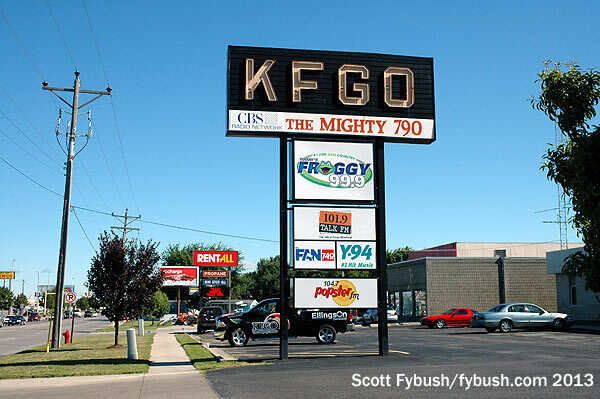 KFGO (790) isn’t lying when it calls itself “The Mighty 790”: its 5,000-watt signal across some of the best soil in the nation gives it coverage of most of North Dakota, as well as big chunks of western Minnesota, South Dakota and Manitoba. And few local stations anywhere are as good as KFGO when it comes to super-serving their communities. 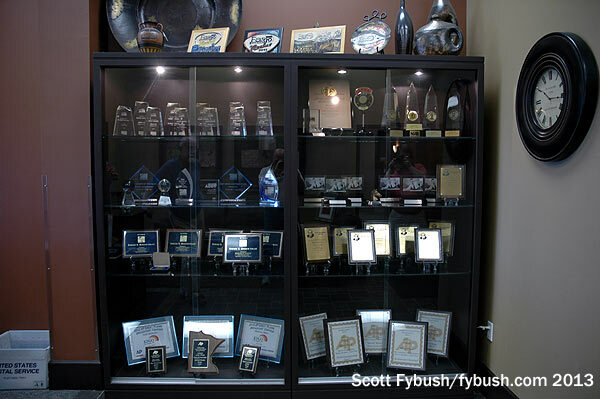 Look at the size of that newsroom, below – these folks are serious about providing news coverage of their region, especially in times of disaster, and it pays off every year in national award after national award (check out that awards case in the lobby, which includes two Peabodys!) and in what might be the highest ratings of any AM in America. KFGO topped the market with a 15.5 in the last book before we visited, and it’s since leveled off at what’s still a crazily impressive 11.4 this past spring. Here, too, we had some camera glitches (though traveling companion Garrett Wollman has filled in some gaps) – and our host, Jack Sunday, was just about to go on the air with his own talk show, part of an all-day local lineup on KFGO, so we had just a quick tour of the impressive studio cluster that forms the north side of this building along the 25th Street corridor, the next major north-south artery west of University. Things were in transition here when we visited: in an unusual series of transactions, owner Jim Ingstad sold this cluster to Duke Wright’s Midwest Communications in May 2013 for $25 million, only to jump across 25th Street and buy a competing cluster (which we’ll see in a moment) from Larry Wilson’s L&L Broadcasting, which had itself just bought them from Triad Broadcasting. Confused yet? It gets even twistier: one pair of stations then swapped again. 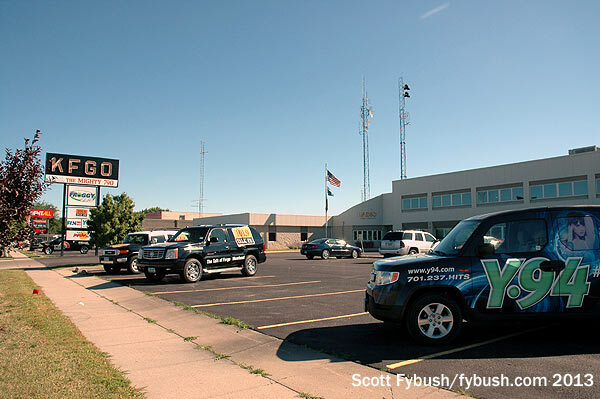 Ingstad ended up keeping country “Bob” KBVB (95.1 Barnesville MN), which had been part of this “Radio Fargo-Moorhead” cluster – and country “Froggy” KVOX-FM, which had been a Triad/L&L station, came over here to Radio Fargo-Moorhead. Way down at the southwestern corner of the market, on 52nd Ave. S. west of I-29, we find the oldest religious station in the market. 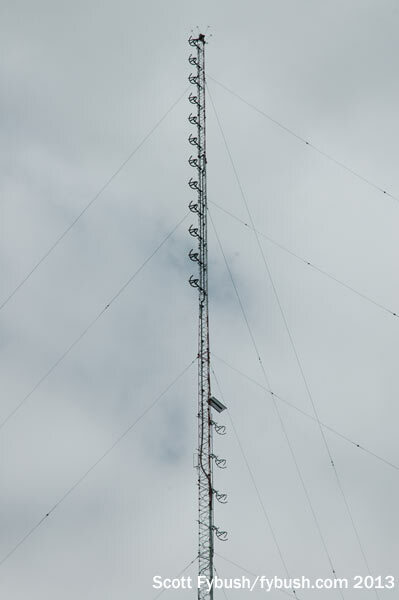 Licensed to West Fargo, KFNW is now on 1200, running 50 kW by day and 13 kW by night from four towers. While it’s had several spots on the dial, it’s had only one owner ever since its 1955 debut: the former Northwestern College in St. Paul, more recently renamed University of Northwestern – St. Paul. 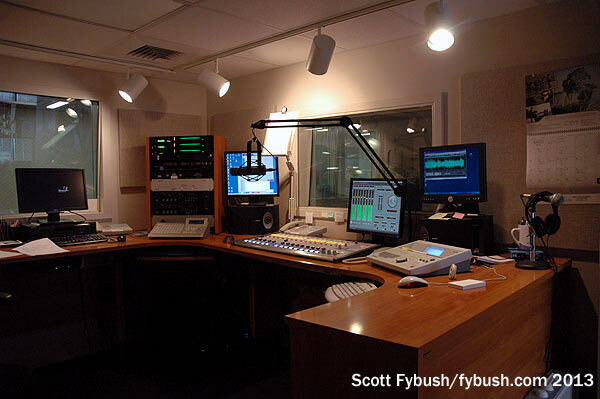 The college put KFNW on the air at 900 on the dial, added KFNW-FM on 97.9 in 1965, then moved down here in 1977 when KFNW(AM) shifted from 900 to 1170. 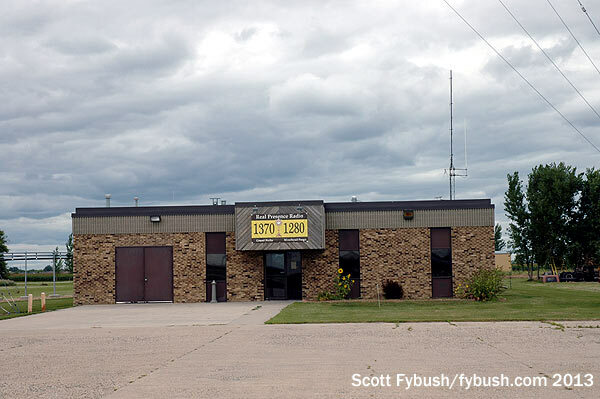 At that point it was still a daytimer; full-time operation came in the early 1980s with the move to 1200 and the change of city of license to West Fargo. That leaves just two more quick stops on the North Dakota side of the river: Fox affiliate KVRR (Channel 15) is the flagship of a four-station network that covers most of North Dakota, and it makes its studio home in a low-slung building near the West Acres Mall (not far from where KXJB used to be), just south and west of the I-29/Main Avenue (US 10) interchange. 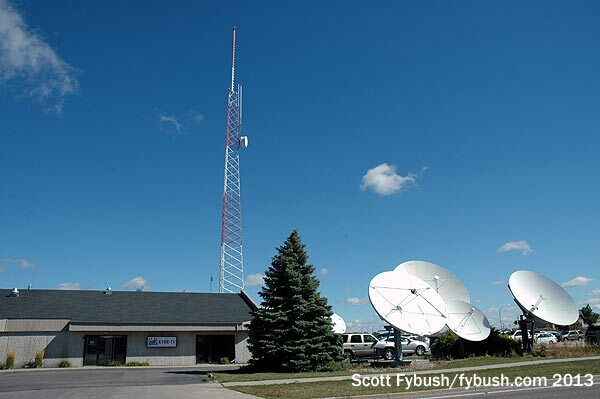 Also out here (not far from the old WDAY 970 site we showed you last week) is the other LPFM in town, and no, we’re not quite sure why North Dakota State University’s KNDS-LP (96.3) ended up on a tower above a tire shop on Main Avenue in West Fargo instead of on the campus north of downtown. With clouds rolling in and a bit of rain, we cross the Main Avenue bridge one last time and fight some traffic through downtown Moorhead, Minnesota on the way out to two AM sites located out to the northeast of Moorhead. 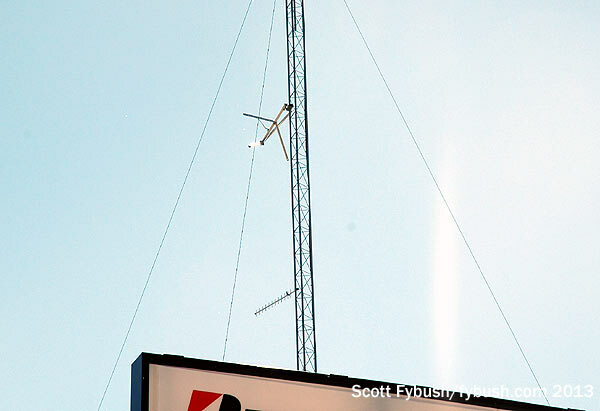 One of the newest 50,000-watt AM sites anywhere in America is up here: the six towers of KVOX (740 Fargo) have been out here only since this signal came on the air in 2006. 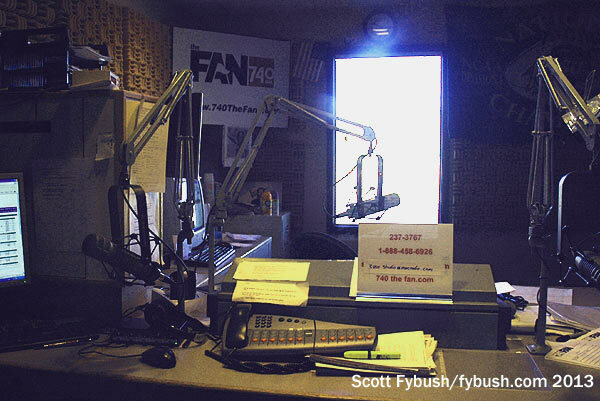 After a brief debut under its construction-permit calls of KKAG, the signal (which drops to 7500 watts in critical hours and just 940 watts at night) took the venerable KVOX calls in 2007 when Jim Ingstad bought it; the “Fan” sports network (with programming from Minneapolis) and the calls moved up the dial from 1280, which we’ll see in a bit. 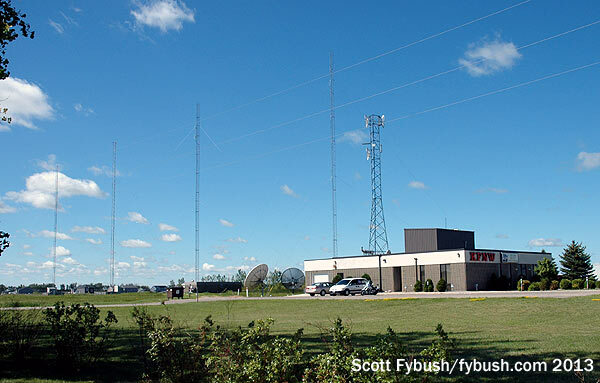 KQWB (1660 West Fargo) has a five-tower array just to the west of 740. 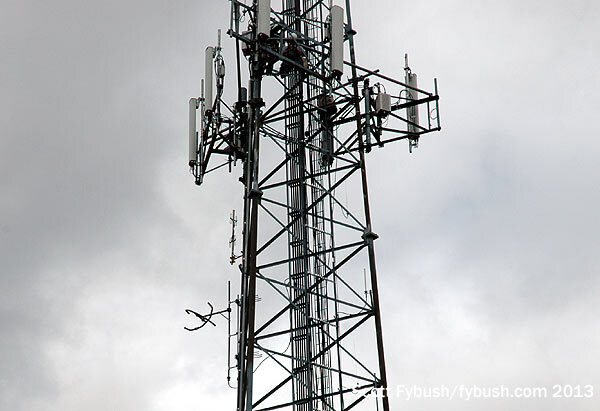 Why does a non-directional AM with the standard 10 kW day/1 kW night setup have a five-tower array? Because it was on 1550 first, initially as KUTT in the early 1960s. 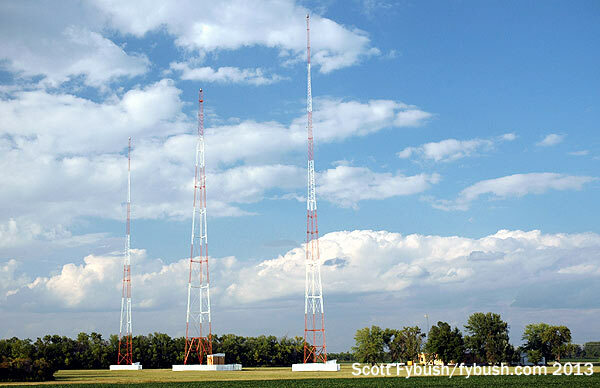 The owners of top-40 giant KDWB in Minneapolis bought 1550 in the mid-1960s and made it KQWB, and the calls stuck even as the formats changed over the years, and those five towers all stayed up even after 1550 went away and 1660 launched in the 1990s. 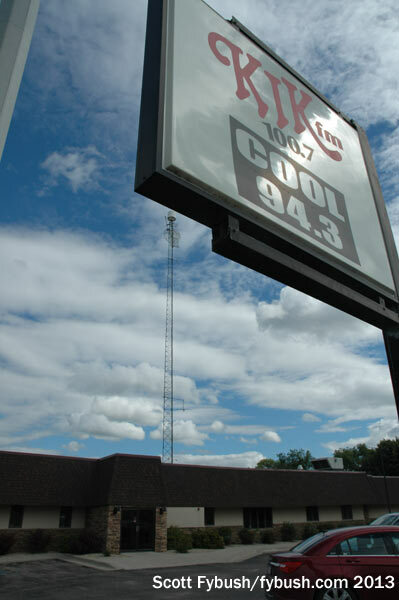 After Ingstad moved “the Fan” and the calls to 740, 1280 was sold off to become the area’s Catholic station under new calls KVXR; today, it simulcasts with KWTL (1370) up in Grand Forks, which occupies the former AM facility of Prairie Public’s KFJM, now FM-only. 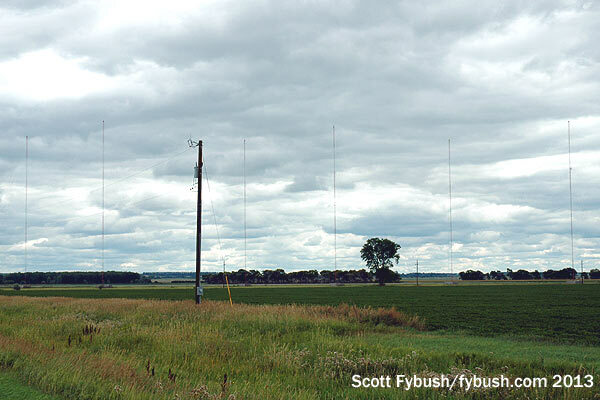 And just to further complicate matters, this 1280 site is also the home of two FMs, neither of which is co-owned with 1280 and both of which were involved in the big 2013 ownership swap: KBVB (95.1) and KVOX-FM (99.9) both use the tall middle tower at 1280. 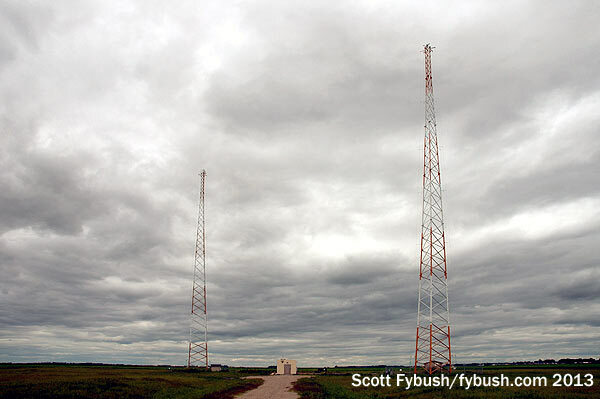 Under cloudy skies here, we take in a few more final sites before bidding Fargo-Moorhead a fond farewell: WZFG (1100 Dilworth) is the other new 50,000-watter here, operating from two self-supporting towers in Sabin, Minnesota, west of I-94 and south of Moorhead. 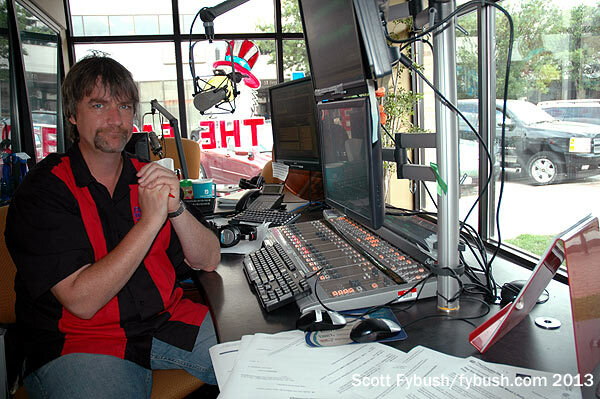 Talker Scott Hennen left his position at WDAY (whose new 970 site is also near here) in 2008 to buy the 1100 signal, which had been operating in test mode as WZFN for only a few months, launching the station that summer as WZFG, “The Flag” from those Radio Center studios on Broadway we showed you earlier in the column. 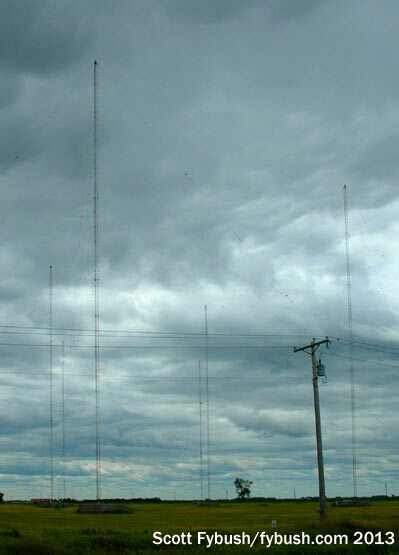 While WZFG drops way down to 5000 watts in critical hours and 440 watts at night, using both towers to protect WTAM in Cleveland, its 50,000 non-directional daytime watts get out very well – and in times of flooding, WZFG often keeps the big 50,000-watt signal on all night with news, when it’s heard over much of the country. 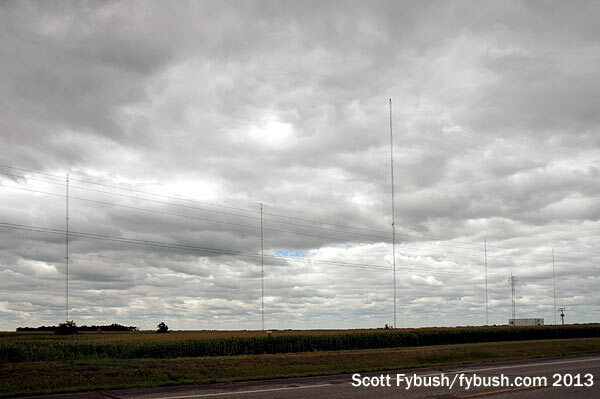 There are two more tall towers near here: east of I-94 near Barnesville, Fox affiliate KVRR (Channel 15/RF 19) has its transmitter; to the west of 94, near the WZFG site, Minnesota Public Radio’s two networks serve the market over KCCD (90.3 Moorhead, with news) and KCCM-FM (91.1 Moorhead, with classical). 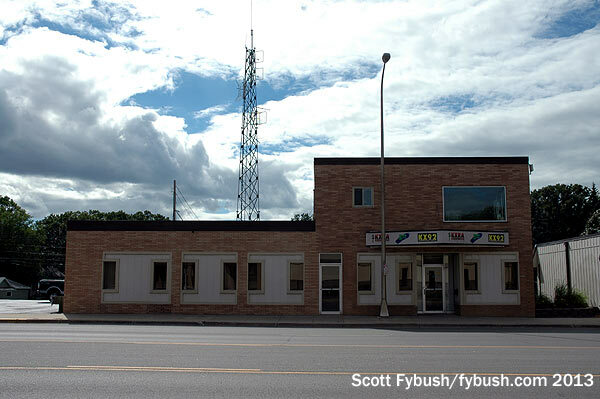 The KCCD/KCCM site near Sabin has quite a history to it: before channel 11 built its tallest tower northwest of Fargo, this was the site of Fargo’s original channel 11, KXGO/KEND. That’s about all the Fargo we can possibly show you, but before we head on to our final Big Trip destination, St. Cloud, Minnesota, we’ve got 160 miles or so of I-94 to cover. There’s not a lot of radio along this stretch of the highway, but we hop off the interstate at least briefly for a few glimpses of this lake-dotted region of the 10,000 Lakes State. It’s another 50 miles down the highway from Fergus Falls to Alexandria, which sits on a peninsula encircled by a string of small lakes. 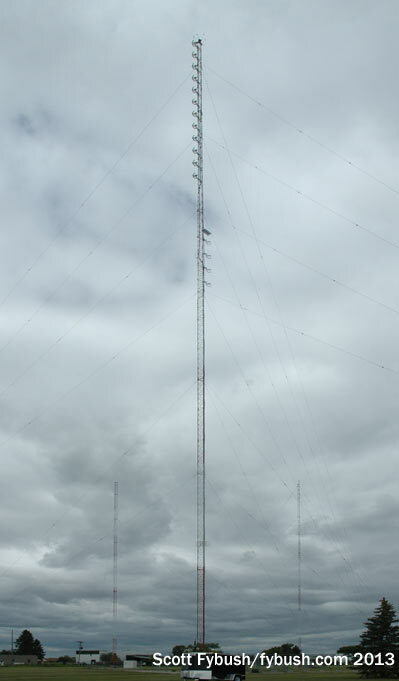 With time running short, we can’t head too far north to several FM sites, but just east of downtown we find the tower of the legacy AM in Alexandria, KXRA (1490), topped by its new FM translator K262AT (100.3). 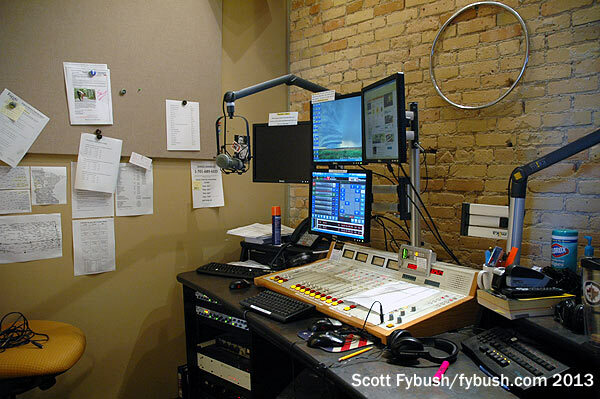 The studios of KXRA, KXRA-FM (92.3) and KXRZ (99.3) are all right on Broadway Street, Alexandria’s main drag; where it ends on the north side of downtown, we turn west on Third Avenue to see the studios of the other cluster in town, oldies KULO (94.3) and country KIKV (100.7 Sauk Centre). And that’s almost it for Big Trip 2013 – but not quite, because there was one more big evening of tower-hunting fun awaiting us an hour away in St. Cloud. We’ll show you what we saw there in our final installment next week. And don’t miss a big batch of IDs from Fargo, Fergus Falls and Alexandria next Wednesday, over at our sister site, TopHour.com!